The Moltin iOS SDK allows you to easily add Apple Pay to your mobile eCommerce store, so you can sell to customers seamlessly using a fully native payment method that they’re extremely familiar with. In this post, we’ll be taking you through the process of adding Apple Pay to you Moltin store in Swift. If you haven’t created a store yet, you can check out our previous tutorial on creating a Moltin store in Swift. Firstly, ensure that you have a Moltin store set up with a product in (so that you can buy something in the tutorial app), and linked to a Stripe payment gateway. Now, let’s get started on creating the app! Now, head back to your terminal window and run pod install, then open the .xcworkspace file that gets created. Now, you’re ready to start using our iOS SDK in your Swift code for Apple Pay! Next, get your store’s Client ID (you’ll need a Moltin account and store) - you’ll need to include these in the app in the next step of this tutorial. Also, ensure that you create some mock products in your store so that you can see them in your iOS app. Replace YOUR_STORE_ID with the Moltin client ID of your store. This initializes the Moltin SDK for use with your Moltin store. You’ll also need to replace YOUR_KEY with the publishable key from your Stripe Dashboard. Now we’re going to add the ‘buy’ button. When tapped, this button will add an item to your cart, checkout and then pay via Apple Pay. 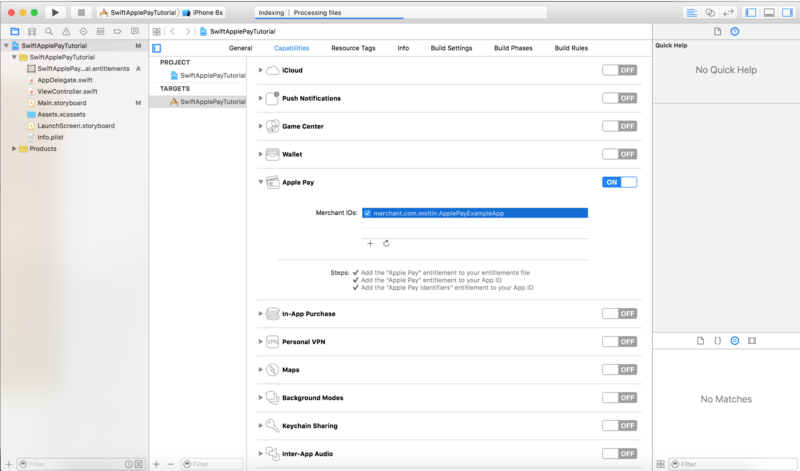 In a production app, you’d have product lists and a full cart/checkout flow (like in our Swift and Objective-C example apps), but for the purposes of this tutorial, we’ll just have one button that does all three steps. // Added to cart - now let's check-out! Now we’ve got the add to cart code implemented, the next stage is to set up the checkout procedure to integrate with Apple Pay. In your production iOS apps, you’ll be offering beautiful checkout interfaces where users can enter their details elegantly (you can see an example of what we suggest in our iOS Example App project on GitHub), but in this example, we’re going to hard-code the checkout details into the app to keep the tutorial as easy to follow as possible. // Moltin and Stripe support all the networks! // TODO: Change these for your country! This causes an Apple Pay sheet to be shown asking the user for billing information and shows the total amount payable. In a production app, you’ll also want to calculate the total amount payable/item details and price here from the cart, and add shipping options to select, but for the sake of simplicity in this tutorial, we’re just hardcoding this data in. 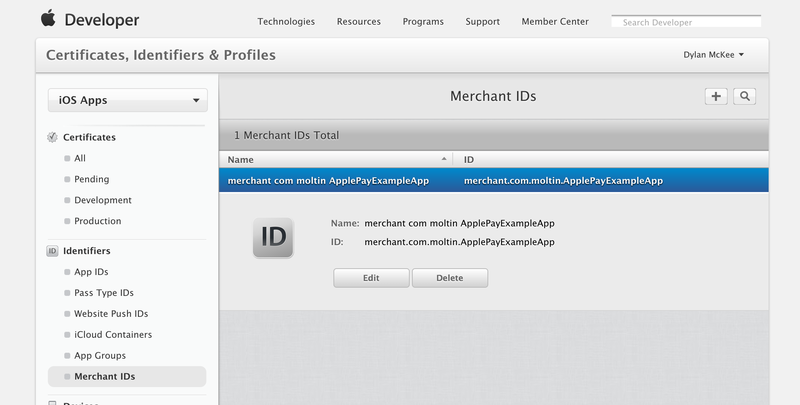 You’ll have to replace YOUR_MERCHANT_ID_HERE with the merchant ID that you created previously in the Apple Developer Portal. Now, we’ll implement the PKPaymentAuthorizationViewControllerDelegate protocol so that we can receive callbacks and checkout with Moltin once the Apple Pay payment is confirmed. // We can now pass tokenValue up to Moltin to charge - let's do the Moltin checkout. // TODO: Enter your store's default shipping option slug (if it's not 'free_shipping')! 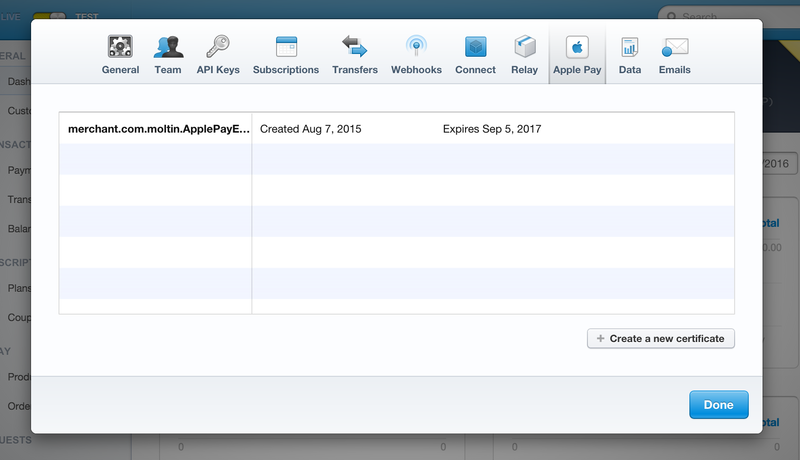 This code sends the Apple Pay token to Stripe, then gets a Stripe token, which is then passed to Moltin where the checkout and payment is completed and the contact details selected in the Apple Pay sheet are used as the user’s billing/shipping details for the Moltin checkout process - no typing or further user input required! In production, you’d want to perform some error checking/validation where mentioned, but for simplicity, we’re just assuming the user selects enough valid data at the Apple Pay sheet. And if you run it on your device, you should be able to go ahead and make a real purchase! 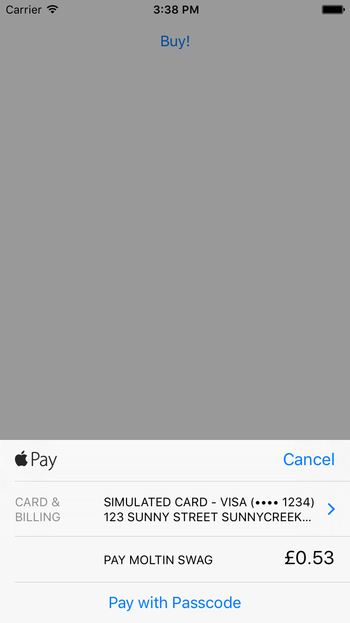 Congratulations - you’ve just built Apple Pay into your Swift eCommerce app with Moltin! For a more thorough example that include a cart, collections, checkout flow and more, why not take a look at our Example Swift App our Example Objective-C app. You can check out the source code for this tutorial project on GitHub.